Are you concerned about the amount of plastic we are throwing away? Save money and dispose less plastic the next time you take the trash out to your streetside trash can. Carry the trash container with you and leave the plastic bag in as a liner. If you have wet garbage, reuse those plastic grocery bags that you had to take home because you forgot to bring your reusable bag into the store. If what you are throwing away is compostable, put it in a compostable, biodegradable bag and throw it in a composter. These bags are usually made from corn or other renewable resources, and these bags are certified to be compostable and biodegradable. 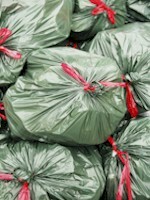 Search the web for compostable biodegradable bags or biodegradable trash bags and other information about composting. GREEN TIP: Do you know for sure what your local recycling company will take and what they won't? You should. Search the web for your local waste management site and follow the rules. If you put the wrong items in your bins the entire load may be rejected. Ideal World is a registered trademark.